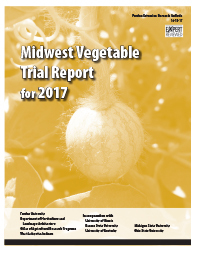 Reports of vegetable trials from 2017 are published online in the Midwest Vegetable Trial Report for 2017. There are reports of variety trials for green beans, cantaloupe/muskmelon, slicing and pickling cucumbers, ornamental corn, bell peppers in field and high tunnels russet potatoes, pumpkins, spinach in high tunnel, butternut squash in stripped-till rye, sweet corn, fresh market and saladette tomatoes, tomatoes in high tunnels, and watermelon. The trials were conducted in Illinois, Indiana, Kansas, Kentucky, Michigan, Ohio, and West Virginia. This and previous reports in the series are a good source of information on relative performance of vegetable varieties.